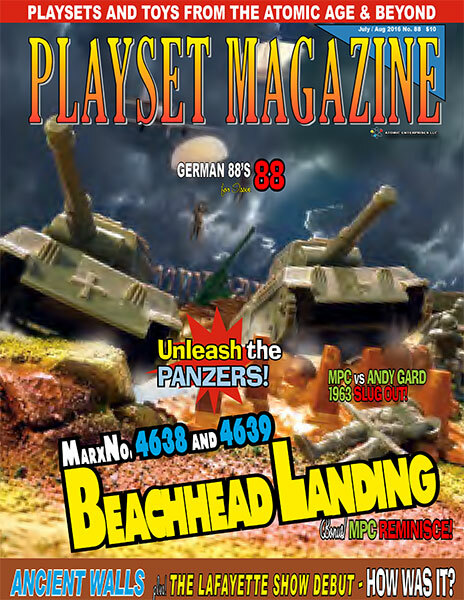 PLAYSET MAGAZINE ISSUE 88: BEACH HEAD LANDING! GERMAN 88'S FOR PLAYSET MAGAZINE ISSUE 88! PM’s July August Issue hits the mail! It’s German 88’s for Issue 88! Let’s “hit the beach” and Let Loose the Panzers as this month’s feature article drops the gate on a landing craft’s worth of fun you’ll remember as a kid and beyond with “Beachhead Landing,” Marx’ dynamic replacement for the D-Day set of the year before. Utilizing a host of German forces, new Panzer tanks and a dozen other new items, Set No’s 4638 and 4639 mount a massive attack on the European shorelines of the imagination. Plus, the new box is easily one of the greatest box designs Marx artists ever thought up and you get it bigger and better than ever on our pages. It’s one you have seen and no doubt admired, but has never before been fully documented so here it is, in spot-on glorious full color in the July / August issue. Adding to the Summer’s worth of fun, it’s “those darn weasels!” and an “MPC VS Andy Gard Slug Out” as we check out the minute differences between Andy Gard and MPC military armor. Plus there’s Andy Gard’s 1963 military catalog pages! Whoa – never before! Then you’ll enjoy the mysterious archways, busy markets and guarded temple entrances of a vast ancient Egyptian city glitter in “Ancient Walls”, one readers’ recreation of the wonders of the ancient world. But wait – what’s that made of? And who are “Presidents by JJ?” We want to know and you will too, it’s all here this issue. We bear breaking news with “Artistic Bomb Run” – what really happened to Van Gough’s famous house? One reader knows, and he’s telling all! With photos! Read about the new LaFayette toy show, and certain reports stating whether or not collectors made this new show a success, and as issue 88 debuts, the 88’s are loaded and ready to start lobbing their best shots of the Summer. Grab yer helmet and find a foxhole to unwind and have some quality collecting time with this issue as PM breaches the Atlantic Walls into another great issue! Thanks for making us a part of your collection!